← Looking for a book club? 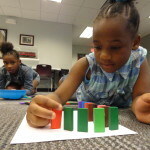 Kids built (and toppled) Domino runs using blocks, Popsicle sticks, and their creativity earlier this summer at our Main Branch. There were curves, splits, and even some 2-story creations! We’re building everything from box villages to toothbrush-powered robots at the library this summer, because our theme for Summer Reading is Build A Better World. So don’t forget to sign up for Summer Reading the next time you visit the library. Everyone who participates in our summer reading program has a chance to win prizes. The more someone reads, the better chance they have of winning. For more information on summer reading and other library programs, call us or check out our event calendar. 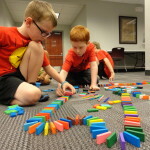 Jacob and Killian collaborate on a Domino run. A’zariah adds a curve to her domino run. Sam decided to put his Dominoes in the shape of a tree. Visit our Facebook page for more photos from our Domino Run program. 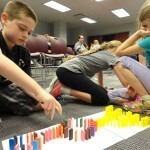 This entry was posted in Uncategorized and tagged Build a Better World, domino, Mentor Public Library, summer reading. Bookmark the permalink.